On February 13, the combined Arctic and Antarctic sea ice numbers were at their lowest point since satellites began to continuously measure sea ice in 1979. WASHINGTON: The sea ice extent at the Arctic and around Antarctica hit a record low earlier this month, according to NASA scientists. Arctic sea ice reached a record low wintertime maximum extent on March 7, researchers said. On the opposite side of the planet, on March 3 sea ice around Antarctica hit its lowest extent ever recorded by satellites at the end of summer in the Southern Hemisphere, a surprising turn of events after decades of moderate sea ice expansion. Total polar sea ice covered 16.21 million square kilometres, which is two million square kilometres less than the average global minimum extent for 1981-2010 - the equivalent of having lost a chunk of sea ice larger than Mexico. The ice floating on top of the Arctic Ocean and surrounding seas shrinks in a seasonal cycle from mid-March until mid-September. As the Arctic temperatures drop in the autumn and winter, the ice cover grows again until it reaches its yearly maximum extent, typically in March. The ring of sea ice around the Antarctic continent behaves in a similar manner, with the calendar flipped: it usually reaches its maximum in September and its minimum in February. This winter, a combination of warmer-than-average temperatures, winds unfavourable to ice expansion, and a series of storms halted sea ice growth in the Arctic. This year's maximum extent, reached on March 7 at 14.42 million square kilometres, is 97,00 square kilometres below the previous record low, which occurred in 2015, and 1.22 million square kilometres smaller than the average maximum extent for 1981-2010. "We started from a low September minimum extent. There was a lot of open ocean water and we saw periods of very slow ice growth in late October and into November, because the water had a lot of accumulated heat that had to be dissipated before ice could grow," said Walt Meier, a sea ice scientist at NASA's Goddard Space Flight Centre in the US. 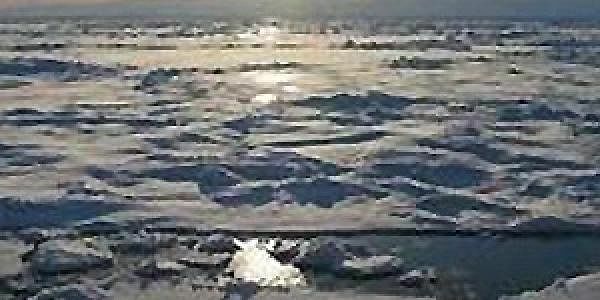 "The ice formation got a late start and everything lagged behind – it was hard for the sea ice cover to catch up," said Meier. The Arctic's sea ice maximum extent has dropped by an average of 2.8 per cent per decade since 1979. The summertime minimum extent losses are nearly five times larger - 13.5 per cent per decade. Besides shrinking in extent, the sea ice cap is also thinning and becoming more vulnerable to the action of ocean waters, winds and warmer temperatures, researchers said. In Antarctica, this year's record low annual sea ice minimum of 2.11 million square kilometres was 184,000 square kilometres below the previous lowest minimum extent in the satellite record, which occurred in 1997.